Savvy fund development professionals feel confident pursuing grants from traditional foundations but are less sure about maximizing funding from donor-advised funds (DAFs). 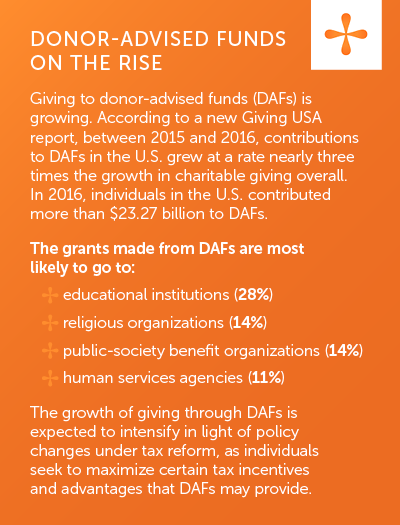 DAFs are one of the fastest-growing giving vehicles: the number of individual DAFs increased by more than 60% from 2016 to 2017 and donors allocated $19.08 billion in grants from their DAFs to charities in 2017. The donors who give through DAFs are often high-net-worth individuals with the propensity to volunteer and make major or planned gifts. That means that nonprofits risk missing out on a major funding source if their fundraising plans and practices don’t take DAFs and DAF donors into account. Read the full Giving USA Special Report, The Data on Donor-Advised Funds: New Insights You Need to Know. Don’t overlook the donors giving now to your organization through donor-advised funds. Think you don’t have any? Make sure your gift processing team knows how to spot them. Checks won’t come directly from the donor, but from a sponsoring organization—most likely, a financial firm (like Fidelity Charitable, Charles Schwab, or Vanguard), or a community foundation (such as The Cleveland Foundation or Greater Cincinnati Foundation). When you receive a DAF donation, soft credit the gift to the donor in your database so you can build a record of the donor’s giving and treat them appropriately. Send a timely thank you letter (not a tax receipt) directly to the donor and consider including them in your major gift process for research, cultivation, and personalized solicitation and stewardship. Development officers sometimes hesitate to contact a DAF donor directly, presuming that because the donor is giving through a DAF, they must want to keep their distance. Don’t start with this assumption. The letter that accompanies the check will typically include the donor’s name and address, and you should attempt to cultivate and steward the relationship as you would any other. Since most DAF donors do their giving from their funds online, consider upping your digital giving game by installing the DAF Direct widget on your website. The Centers for Families and Children has DAF Direct, allowing donors to log into their Fidelity or Schwab charitable accounts directly from The Centers’ website to make a grant to the organization. At a minimum, make it easy for DAF donors to obtain your organization’s legal name, address, and federal tax ID number so they can recommend a check be mailed through their DAF account. That means including language in your fundraising and marketing materials that encourages donors to give through their donor-advised funds. You can devote a webpage to information about DAF giving (St. Jude Children’s Research Hospital has a good example), feature a story about a DAF donor in your newsletter, and include donating through a donor-advised fund as a giving option in your annual appeal. However, if you do solicit DAF donations, keep in mind that donor-advised funds cannot be used to satisfy a pledge or purchase tickets to a fundraising event. There isn’t a central database to search for funding from donor-advised funds, like there is for researching grants made by traditional foundations. However, there are networks of people who help individuals establish and administer donor-advised funds, including wealth, tax, and legal advisors, and the fundraising and donor services staff at community foundations. Do attempt to nurture relationships with the donor services staff at your local community foundation. These individuals are responsible for helping their donors fulfill their philanthropic aspirations, and may accept your invitation for an introductory meeting or site visit in order to take information back to their DAF donors. Making these relationship inroads won’t always result in an immediate contribution, but but you’ll be a step closer towards new philanthropic opportunities. What’s most important to know about donor-advised fund donors? Like your other donors, they want to meaningfully impact the causes they care the most about. There is no magic to getting donations from donor-advised fund donors, but by raising awareness, doing some targeted outreach, and offering the same gratitude and respect that you would to any other donor, you are almost sure to see your gifts from donor-advised funds begin to grow.